Powder Keg Test Run Photos! Check 'em out! 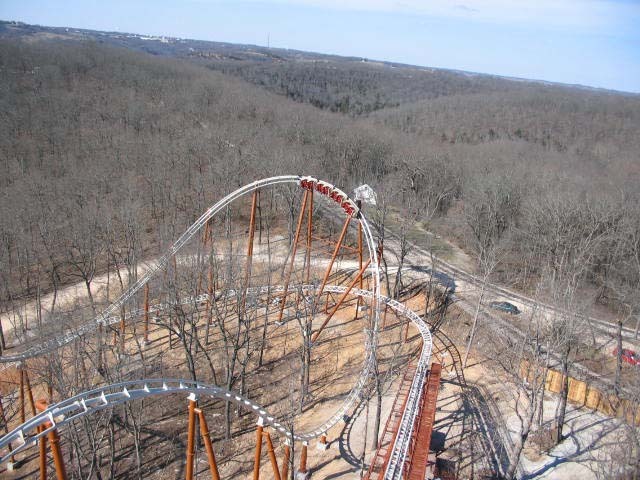 The nice people over at Silver Dollar City have just emailed me some pics of the ride testing! Below is their most recent press release along with the photos! I for one am very interested in this ride since it's the first ride to show off the 'marriage' of S&S and Arrow technology. (Branson, Mo. 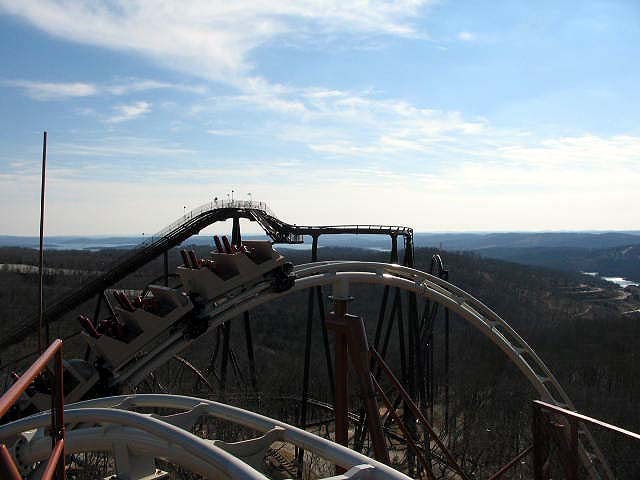 2/05) The Silver Dollar City theme park in Branson, Missouri is presenting an all-new super launch coaster for Spring 2005 that shoots riders into a thrill zone within seconds of climbing aboard, launching them from 0 to 53 miles per hour in just 2.8 seconds. 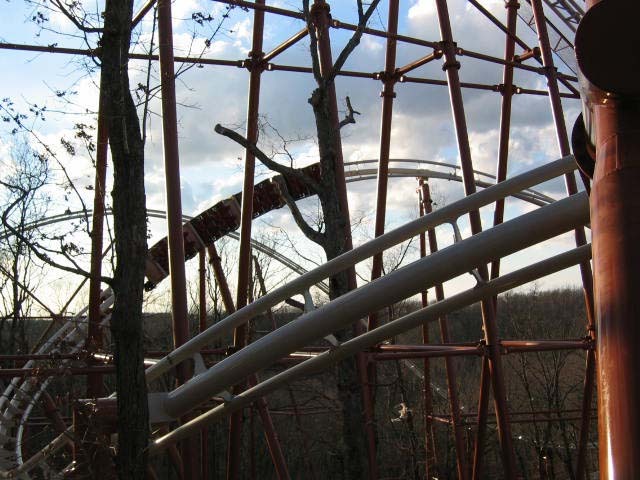 Constructed within the forests of the Ozark Mountains and winding down a hillside, Powder Keg is a family thrill ride unlike any other in the history of the park. 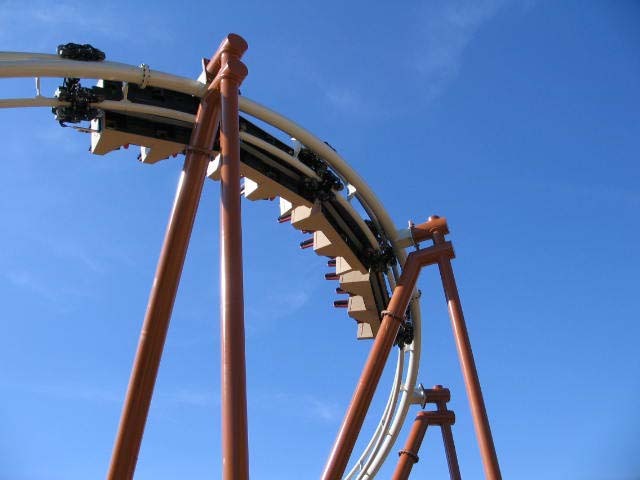 It combines launching speed with spiraling turns, negative gravitational or “G” forces, and “floater” hills to create a thrill ride of great magnitude. In addition, it’s packaged in an environmentally sound design. “An air launch system like this is amazing - there is great launching speed yet virtually no impact on the environment,” said Stan Checketts, founder and CEO of Powder Keg manufacturer S&S Power of Logan, Utah. 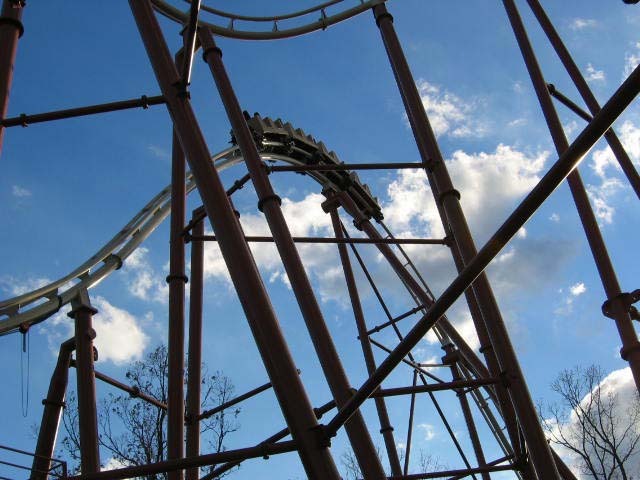 S&S is the world’s leading manufacturer of compressed-air rides and the largest ride manufacturer in the United States. In keeping with Silver Dollar City’s internationally-awarded commitment to bringing the colorful history of regions to life, Powder Keg salutes the miners who worked in the great Marvel Cave, which is located below the theme park. In the late 1880s, tons of nitrogen-rich bat guano were hauled out of the cave’s massive sinkhole using an archaic pulley system. The guano was taken by stagecoach and railroads to powder mills across the state and the country where it was used to make valuable black powder. “The Powder Keg ride begins in a powder mill amid barrels of nitro-explosives that rock and tip,” said Brad Thomas, general manager of Silver Dollar City. “As the nitro ‘explodes,’ the cars blast out of the building with special effects of fire and smoke shooting through the roof!” While the ride offers thrills, it has been designed to accommodate families. Anyone over 42 inches in height can ride, which is roughly a five or six-year-old, said Thomas, who cites guest surveys that resoundingly requested a family thrill ride as the reason for choosing Powder Keg. 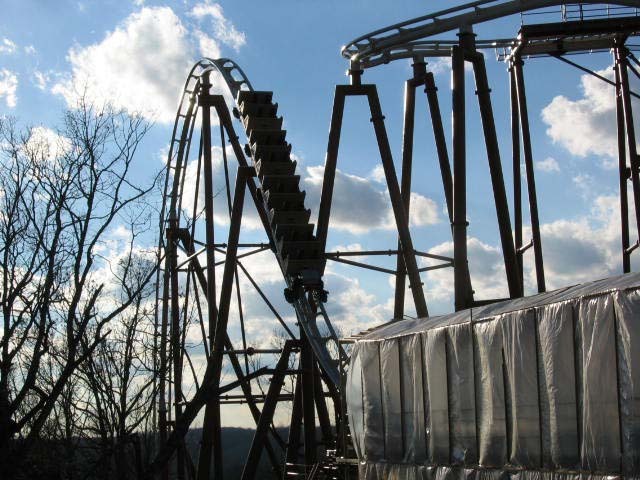 A trip on Powder Keg lasts nearly three minutes and spirals around six acres on 3,500 feet of track. The ride carries more than 1,000 people per hour with 16 passengers per train. Silver Dollar City’s Corporate Development team and the Maintenance & Construction Division are handling theming and construction. Last edited by robbalvey on Wed Feb 23, 2005 2:57 pm. Awesome! This ride is really looking like a solid investment. Thanks for the pics Robb! Is anybody taking this thing for a sping this year? ^ YES! We will be there in May. And we'll have a full report then! Awesome photos, I wish I could go to Missouri this summer. Unbelievable. This ride looks really good and is the next point on my list. I like the looks of that overbank in the last picture. 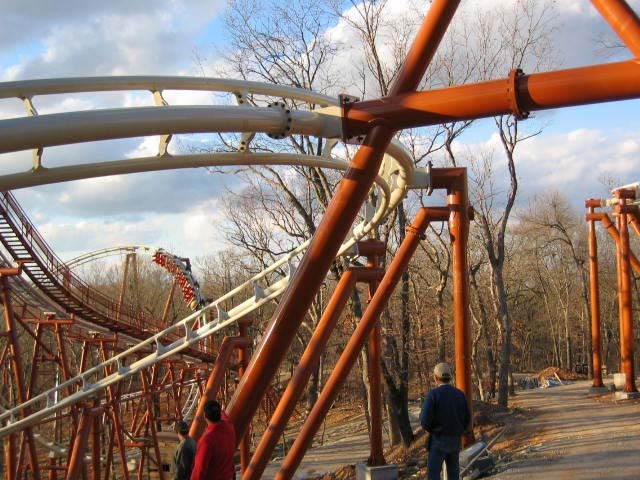 Can't wait to ride it in June. Wow! That ride looks so cool! Can someone explain what the little track that comes out the launch bit is used for. It looks like the back spike fo a shuttle coaster and can be seen on the parks promotional artwork for the ride. I swear I saw a picture of it on the internet someplace. If I find it i will post it. I was just wondering why they would need a spike of track like a shuttle coaster uses when this is a full cicuit coaster. -Justin "who hasn't seen ANY part of the ride's layout until now"
WOW! I have to say I really wasn't all that impressed with this ride until I just saw these pictures! Now I'm pretty excited about getting to hit it come May!